The Institute for Astronomy, Astrophysics, Space Applications and Remote Sensing (IAASARS) of the National Observatory of Athens (NOA), expects to have several tenure track researcher positions over the next two years. We are interested to recruit motivated individuals with strong publication record, several years of research experience past their PhD, international collaborations, and ability to attract funding. Complementarity with the research areas already pursued at IAASARS/NOA as well as interest to efficiently use or upgrade existing infrastructure is also desired. ESA offers a wide range of student internship options for students in their last or penultimate year of a Master's degree. Two promotion-opened positions in the field of Observational Astrophysics at the level of Full Professor have been opened at the Department of Physics of the University of Crete. The Academy of Athens has posted an announcement of three positions for research assistants to work in the following programs of the Research Center for Astronomy and Applied Mathematics: 1. Nonlinear phenomena in galactic discs - 2. Galactic dynamics -3. The role of magnetic fields in the heating of solar active regions and in flares. Information: Check the announcement here (in greek). A new tenure-track position at the level of "Professor" or "Associate Professor" in the field of "Space Physics" has been opened at the Department of Physics of the University of Athens. One new position in the field of Theoretical Astrophysics at the level of Assistant Professor has been opened at the Department of Physics of the University of Crete. A promotion-opened tenured position at the level of "Associate Professor" in the field of "Dynamical Astronomy" has been opened at the Department of Physics of the University of Athens. The Institute for Astronomy and Astrophysics of the National Observatory of Athens has two (2) openings for employment at the Helmos Observatory. The positions are for graduates of Technological Educational Institutes (TEI) in the field of Electronic Engineering. The duration of the contract is for 6 months with the possibility of extension. A new tenure-track position at the level of "Assistant Professor" or "Lecturer" in the field of "Theoretical Astrophysics" has been opened at the Department of Physics of the University of Athens (F.E.K. 1168/30-12-2008, page 9579). A new tenure position at the level of "Professor" in the field of "Space Physics" has been opened at the Department of Physics of the University of Athens (F.E.K. 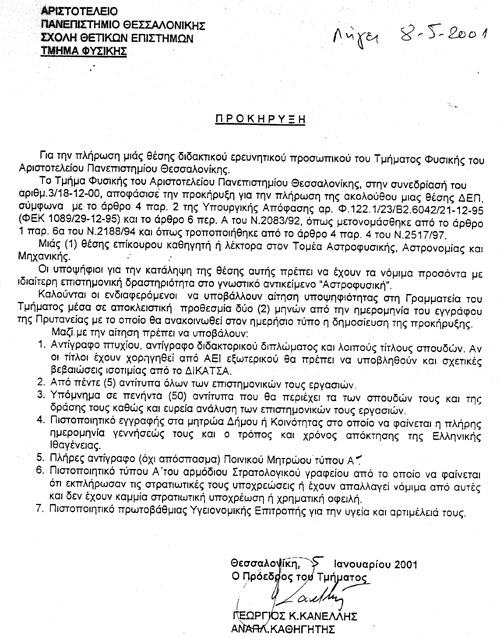 1192/31-12-2008, page 9776). A promotion-opened position in the field of Observational Astrophysics at the level of Associate Professor has been opened at the Department of Physics of the University of Crete. A promotion related position at the level of "Professor" in the field of Dynamics has opened at the Department of Physics of the University of Thessaloniki (F.E.K. 462/19-05-2008). Information: The Secretary, Dept. of Physics, Univ. of Thessaloniki, tel: +30 2310 998120. Two new tenure positions each at the level of "Professor or Associate Professor" in the field of Observational Astronomy have opened at the Department of Physics of the University of Thessaloniki (F.E.K. 424/13-05-2008, F.E.K. 425/13-05-2008). A new tenure track position at the level of "Assistant Professor" in the field of Dynamics has opened at the Department of Physics of the University of Thessaloniki (F.E.K. 425/13-05-2008). A position of Researcher D' in the field of "Observational Astrophysics in the optical with emphasis in massive stars" has opened in the Institute of Astronomy and Astrophysics of the National Observatory of Athens. A position of Researcher C' in the Research Center for Astronomy and Applied Mathematics of the Academy of Athens, under the area of "Solar Physics". A position of Associate Professor in the Section of Astronomy, Astrophysics and Mechanics of the Department of Physics of the University of Athens in the area of "Applied Optics". The Greek National Institute of Fellowships (IKY) has announced the graduate and post graduate fellowship program for 2008-2009. A position of Researcher D' in the Research Center for Astronomy and Applied Mathematics of the Academy of Athens, under the area of "Topology of the Universe and the Cosmic Microwave Background". A new tenure-track position at the level of "Assistant Professor" or "Lecturer" in the field of "Observational Astrophysics" has been opened at the Department of Physics of the University of Athens (FEK 619, 17-8-2007). the X-ray astronomy and Cosmology"
A new tenured track position at the level of "Assistant Professor" in the field of Observational Astrophysics has opened at the Department of Physics of the University of Crete. The Greek National Institute of Fellowships (IKY) has announced the graduate and post graduate fellowship program for 2006-2007. A new position at the level of Researcher C has opened in the Research Center for Astronomy & Applied Mathematics of the Academy of Athens. A new tenure track position at the level of Lecturer in the field of Dynamics has opened at the Department of Physics of the University of Thessaloniki. The Greek National Institute of Fellowships (IKY) has announced the graduate and post graduate fellowship program for 2005-2006. The X-ray Astronomy and Cosmology Group at the Institute of Astronomy & Astrophysics at the National Observatory of Athens, Greece, invites applications for a postdoctoral Chandra and XMM-Newton projects position, which could begin as early as January 2005. A position at the level of Associate Professor in the field of Space Electrodynamics has opened at the Section of Telecommunications and Space Science in the Department of Electrical and Computer Engineering of Democritus University of Thrace. A new tenure track position at the level of Assistant Professor in the field of Observational Astronomy has opened at the Department of Physics of the University of Thessaloniki. Information: The Secretary, Dept. of Physics, Univ. of Thessaloniki, tel: +30 2310 998120. Details on the application material can found here (PS file). The I.K.Y. Scholarships for the year 2004 have been announced. For more information and application forms consult the web page of the Institute. A new research position (Ereynhths Gamma) has opened at the National Center for Nuclear Studies Demokritos on Theory of Nuclear reactions with emphasis on Nuclear Astrophysics. A new tenure track position at the level of Assistant Professor or Lecturer in the field of Astrophysics has opened at the Department of Physics of the University of Thessaloniki. A tenure-track position at the level of Assistant Professor in the field of Theory of Relativity has opened in the Department of Physics of the University of Thessaloniki. A new tenure-track position at the level of Lecturer in the field of Observational Astrophysics, the optical part of the spectrum, the interstellar matter and Active Galactic Nuclei has opened in the Department of Physics of the University of Patras. Information: The secretary of the Department at 2610-997441. A new tenured track position at the level of Assistant Professor in the field of "Observational Astrophysics" has opened at the Department of Physics of the University of Crete. The Institute of Electronic Structure and Laser of the Foundation for Research and Technology-Hellas (FORTH) has announced the opening of a tenure-track position of Researcher C level in Observational Astrophysics with emphasis on Optical Photometry and Spectroscopy. Information: Mrs. Lia Papadopoulou at +30 2810-391300, 391303. Three positions at the level of Entetalmenos Epikouros have opened at the Department of Physics of the University of Crete. The scope of the positions is teaching of several courses including observational astrophysics and mathematical analysis. The net monthly salary is 500 Euros. Information: The Secretariat of the Physics Department, tel. +30 81 0394004/0394308. The Academy of Athens invites applications for a researcher (EREYNHTHS Gamma) in fields related to the scientific areas of the RCAAM. A new position of Researcher D in Observational Astrophysics has been opened at the Institute of Astronomy and Astrophysics of the National Observatory of Athens. A position at the level of the Associate Professor in "Dynamical Systems and Celestial Mechanics" has opened in the Department of Applied Mathematics and Physics, Section of Mechanics, at the National Technical University of Athens (FEK 88/8-3-2002). Information: The Secretariat of the Department of Applied Mathematics and Physical Sciences, tel. +30 1 07721982, 07721703. A position at the level of the Assistant Professor in Observational Astrophysics has opened in the Section of Astrophysics & Space Physics of the Department of Physics at the University of Crete. This opening is to fill a vacancy due to a recent tenured faculty move. Information: The Secretariat of the Physics Department, tel. +30 81 0394308. A new position of Researcher D in Observational Astrophysics in optical wavelengths with emphasis in the structure of the interstellar medium has been opened at the Institute of Astronomy and Astrophysics of the National Observatory of Athens. The I.K.Y. Scholarships for the year 2002 have been annouced. For more information and application forms consult the web page of the Institute. A new position at the Associate Professor level in the field of High Energy Theoretical Physics and Cosmology has opened in the Department of Physics (Section of High Energy and Elementary Particles) of the University of Crete. Information: The Secretary, Dept. of Physics, Univ. of Crete, tel: +30 810 394004, 394308, or here. A tenured position at the level of Associate Professor in the field of Theoretical Mechanics: Classical and Relativistic has opened at the Department of Physics of the University of Athens. Information: The Secretary, Dept. of Physics, Univ. of Athens, tel: +30 1 7276807, or on-line here. A new tenure track position at the level of Assistant Professor or Lecturer in the field of Astrophysics will open at the Department of Physics of the University of Thessaloniki. Information: The Secretary, Dept. of Physics, Univ. of Thessaloniki, tel: +30 31 998120. The scanned official announcement with all application details is available here. A new tenure track position at the level of Lecturer in the field of Mechanics has opened at the Department of Physics of the University of Athens. Information: The Secretary, Dept. of Physics, Univ. of Athens, tel: +30 1 7276807. The I.K.Y. Scholarships for the year 2001 have been annouced. For more information and application forms consult the web page of the Institute. A new tenured position of Specialized Scientist - Level B (Eidikos Leitourgikos Epistimonas B' Ba0midas) in the field of design of optics and instrumentation for astronomical applications has been opened at the Institute of Electronic Structure & Laser of the Foundation for Research and Technology in Crete. Information: Mrs. L. Papadopoulou - Secretariat of FORTH, tel: +30 81 391303 or +30 81 391300, or on-line here. A non-tenured position at the level of Visiting Assistant Professor in the field of "Observational Astrophysics with emphasis in observations from earth- and space-based X-ray telescopes" has been opened in the Department of Physics of the University of Crete. Information: Secretariat of the departement, tel: +30 81 394308, 394004, or on-line here. The Department of Physics (Section of Theoretical Physics) of the University of Ioannina invites applications for a position at the Associate Professor or Assistant Professor level in the field of "Theoretical Physics with emphasis on Cosmology". A new position of "Researcher D" concerning "Satellite imaging data of the surface of the Earth and corresponding analysis techniques" has been opened at the Institute for Space Applications and Remote Sensing of the National Observatory of Athens. Information: Mrs. Kolliakou tel: +30 1 3490142, or on-line here. A new position of Researcher D in Observational Astrophysics has been opened at the Institute of Electronic Structure & Laser of the Foundation for Research and Technology in Crete. Information: Mrs. Eleftheria Karali, tel: +30 81 391300 or +30 81 391302, or on-line here. A 3-year position of Researcher D concerning Satellite mobile communications has been opened at the Institute for Space Applications and Remote Sensing of the National Observatory of Athens. The National Observatory of Athens announced an opening for the position of the Director of the Institute of Astronomy and Astrophysics. The Department of Mathematics of the University of Aegean invites applications for a position at the Associate Professor level in the field of "Mathematical Physics - Cosmology". A position of ``Researcher A'' has opened at the Research Center for Astronomy and Applied Mathematics of the Academy of Athens. A promotion-opened'' position in Dynamical Astronomy at the level of Associate Professor has been opened at the Dept. of Physics of the Univ. of Thessaloniki. An Associate Professor position has been opened at the National Technical University of Athens Department of Rural and Surveying Engineering, in the area of astronomy with emphasis on geodetic astronomy. A position of Researcher D in the field of Satellite systems with emphasis in telecommunications applications has opened at the Institute of Ionospheric and Space Research of the National Observatory of Athens. Analysts/programmers to work at INTERSECURE Logic. A new Assistant Professor or Lecturer position has been opened at the University of Ioannina, Department of Physics, Section of Astrogeophysics, in the area of Solar and Space Physics. (3i bathmida) in the area of "Processing of Astronomical Images from Ground and Space Observations at the Astronomical Institute of the National Observatory of Athens. A new Lecturer position in Dynamical Astronomy and a promotion-opened position at the level of Associate Professor in Dynamical Astronomy at the Dept. of Physics, of the Univ. of Thessaloniki.